Largehearted Boy: Book Notes - Scott Blackwood "See How Small"
Book Notes - Scott Blackwood "See How Small"
Scott Blackwood's novel See How Small eloquently depicts the effects a horrific tragedy has on a small Texas town. "The novel has much to say about the mysteries of the human psyche, the far-reaching effects of violence, and the disparate ways grief works on people." 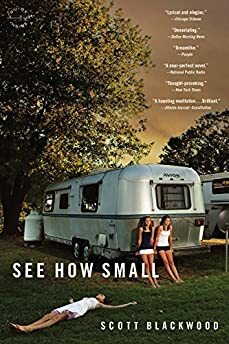 See How Small is a novel about a community caught in the aftermath of a triple murder of teenage girls, the "every girls"of the town. It's a story about dealing with grief, the pull of the past, and living with the unresolved. The murdered girls themselves- their essence- are a presence in the novel and want to move on but the community's grief keeps calling them back. So all of the songs on the See How Small playlist reflect how a residue of pain and joy clings to us, how the world takes on the shape of our wishes to escape the present and to embrace it more fully. Billie Holiday's "I'll Be Seeing You"
This standard was on my mind often because of the ache and joy in Holiday's voice. "I'll be seeing you in all the familiar places…"she sings about the world taking on the shapes of her joys and pain. I imagine if there was ever a film made of the book it might be interesting to have different versions of this song in it. Dwight Yoakum. Cat Power. Tom Waits. Maybe a cow punk version? A great pop song about he differences between childhood and adult weights of the world. I love this song because so much yearning for going back to something you can't quite put your finger on. Cat Power's”Werewolf"and "Sea of Love"
Chan Marshall is an amazing interpreter of other people's songs. I think these two have a scary beauty to them that's unique and fit with the See How Small's mix of the same. In "Werewolf"we're given the werewolf's perspective of what it's like to be compelled to do something horrible. How I loved the man, as I teared off his clothes"
"Sea of Love"is mesmerizing and disquieting, like someone whispering in your ear. Trying to remind you of something maybe you don't want to be reminded of. There's an anodyne quality to the song. Why can't the singer tell you that he/she loves you? What is it you don't remember? Go to the sea with me and you will. L.V. Thomas and Geeshie Wiley's "Motherless Child Blues"
Two amazing black women singers and guitar players who sang keening, lonesome songs—proto-blues really—around small black communities outside Houston in the 20s. This particular song is about a daughter's love and sympathy for her mother, years after her death, because she now realizes that her mother must have seen her daughter's future, had the foreknowledge that her daughter was bound to love every man she sees, and to feel empty because of it, just as the mother had. It's a lament that was on my mind at times writing See How Small and The Rise and Fall of Paramount Records, a book about the legendary record label for whom the two women recorded their only known sides. "Baby now she's dead, she's six feet in the ground, and I'm a child, and I'm drifting round." Louis Armstrong's "Stardust"and "West End Blues"
Louis always leaves gaps for you to fill in with your own feeling. These songs make everything in life worthwhile. "Beside the garden wall when stars are bright…"
Patty Griffin is a terrific songwriter. She doesn't flinch. I want to be as brave as some her songs about desire, restlessness, and the struggle to tell your own story. One of my favorite bands from the mid-eighties scene in Austin. They had an original, infectious sound, a jangly melding of pop and post-punk. "Araby"is loosely based on the James Joyce short story. The lyrics are all fractured and lovely. Incomplete thoughts. It's about being young and your heart exploding over everything you see. I was thinking of this song in relation to the dead girls in See How Small- their yearning lives on through the people around them. "oh my love" fogs up the glass. It's my gift from araby." Is there a song that captures a moment in time quite like this? Innocence at the edge of experience? Small things that weigh so much- the singer's whole world in the balance. Would you tell me what you're thinking of? Would you be an outlaw for my love?